Eucerin In-Shower Body Lotion is an effective body lotion that is specially mild for sensitive skin. 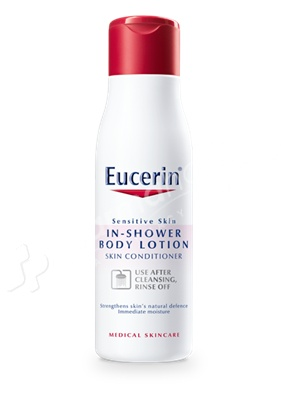 Eucerin In-Shower Body Lotion is an effective body lotion that is specially mild for sensitive skin. The formula with the special hydrodispersion technology and Dexpanthenol has been dermatologically proven to significantly increase the hydration of the skin surface and to decrease tactile roughness. The formula protects and strengthens skin's natural defence barrier, helping to keep bacteria and other harmful substances from entering the body and, at the same time, limiting water loss and preventing dehydration. Eucerin In-Shower Body Lotion is not a 2-in-1 product as it doesn't cleanse the skin. It is applied after cleansing, while still in the shower, and is rinsed off before toweling. The product is paraben-free and contains no perfume or colorants.